11/7/2014Share this story on Facebook! One of Swensen’s students, Greig Watson, M.S. ’04, finished his M.S. at IC and then completed a Ph.D. at the University of Connecticut (UConn). He now teaches health sciences at the University of Tasmania in Australia. Luke Pryor, M.S. ’11, worked with Swensen on his research on betaine— a nutrient found in shellfish and bees— which boosts athletic performance. Pryor and his wife, Riana Czapla Pryor, M.S. ’08, both went on to a Ph.D. program at UConn. She is a certified athletic trainer who teaches in the athletic training education program there. Alana Koehler ’12 worked with Swensen on research about the effects of fish oil on delayed muscle soreness. She is at Strong Memorial Hospital in Rochester, New York, working at a research internship and pursuing an M.D.–Ph.D. dual training program. A: We’re making some IC students sore with sprint tests and then having them take a capsule that contains citrulline, the amino acid found in watermelon juice. The next day we’re testing them to see if their performance is better, which would indicate a better recovery. Q: Can you explain the difference between lack of soreness and improved recovery and performance? A: If you feel less sore, that should translate to better performance. But soreness might be mental or physical. 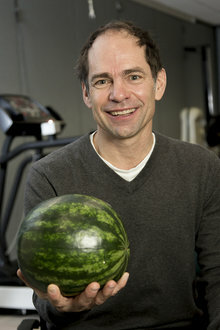 Other studies that said watermelon juice improves recovery didn’t measure muscle recovery. They just measured how participants felt after taking the compound. Q: Are there researchers out there testing every juice or food to see if it improves muscle function or recovery? A: People are looking for a magic elixir. But the bottom line is there is nothing out there that will prevent you from getting sore. If you exercise, you are going to be tired; you are going to be sore. If you are a little overexuberant and do way too much, you’re going to be very sore. The best way to manage muscle soreness is to exercise incrementally, increasing the stimulus a bit at a time and adapting to it before increasing it again. 1. He walks to work. 2. He chose cycling over medical school, which led to his career as a teacher and scientist. 3. He was a history major as an undergraduate. 4. His friends and family consider him to be an excellent cook. 5. He once got sprayed by a skunk on his way to a faculty council meeting and had to take four showers that day.